Advocating for healthy, safe bicycle and pedestrian communities through policy advocacy, community empowerment and education, with particular focus on communities disparately impacted by injuries and fatalities. Walk-Bike Nassau had over 100 attendee's including local, regional and state agencies, health professionals, traffic safety educators, law enforcement, non-profits and the public. The mission was to raise awareness, provide education, and empower residents and community leaders in Nassau County to increase health and safety while walking and biking. Why Walk-Bike Nassau? Look at the charts below - the numbers are sobering. 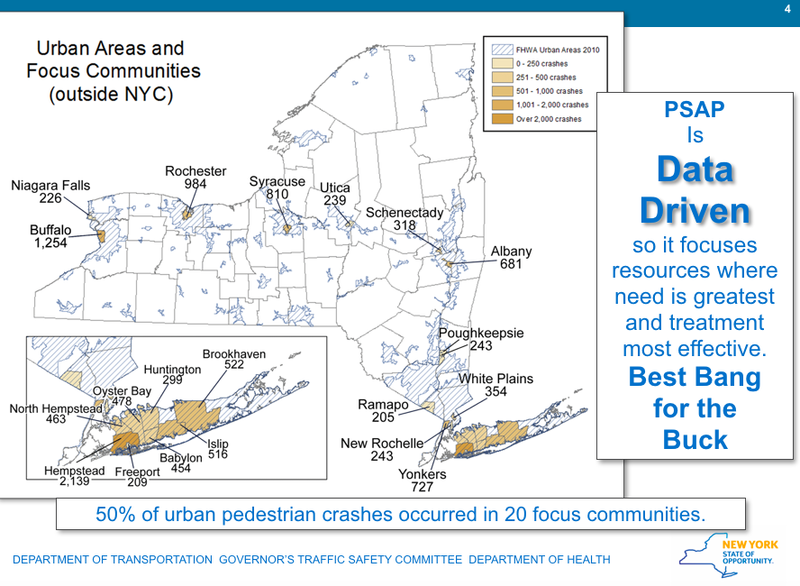 Nassau County has the highest number of pedestrian fatalities, according to the Governors Pedestrian Safety Action Plan, in New York State after New York City and followed by Suffolk County. The Nassau County Traffic Safety Board, which is charged with reducing the number of injuries and fatalities resulting from motor vehicle crashes, is undertaking a campaign to improve pedestrian and bicycle safety in Nassau County. Walk-Bike Nassau was an important step in bringing people to the table to address pedestrian fatality rates while increasing health and safety. 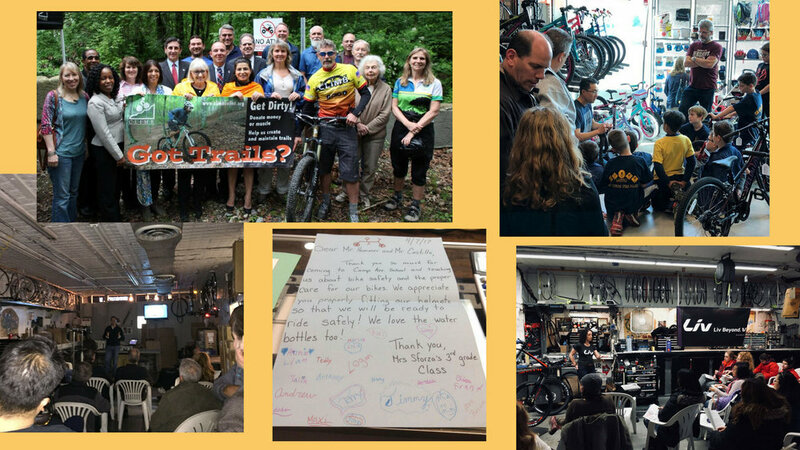 Long Island Streets and partners Flanzig & Flanzig, and CLIMB attended Walk-Bike Nassau, representing on and off road cyclists throughout Long Island, with a focus on bike law, advocacy efforts and the power of cycling clubs and organizations. The event was attended by State and local DOT players, local politicians and key transportation planners as well as those interested in making Nassau a better place to bike and walk. Strength in Numbers was a presentation by Allison Blanchette. Much of the presentation was to demystifying cycling clubs, provide information how to get involved and explain why clusters of cyclists take a lane / cycling behavior on Long Island streets. 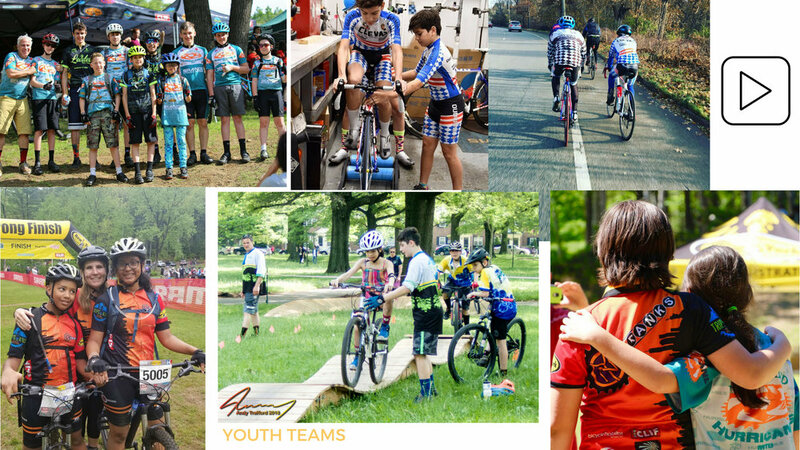 Putting a face to cycling club members on and off road - these are parents, children, neighbors and everyday people.....and then highlighting the tremendous events and education that clubs provide = the true boots on the ground advocates for safer streets and healthy communities through awareness, education, encouragement, sports and recreation. Bicycle Law- Daniel Flanzig's focus was on the lack of protection for cyclists both in legislation and in the brutal reality of riding. Using video provided by our good friend Roger, Daniel was able to demonstrate the danger and difficulty of cycling on Long Island. Walk-Bike Nassau was sponsored by the Governors Traffic Safety Committee in partnership with Long Island Health Collaborative and the NY Coalition for Transportation Safety. 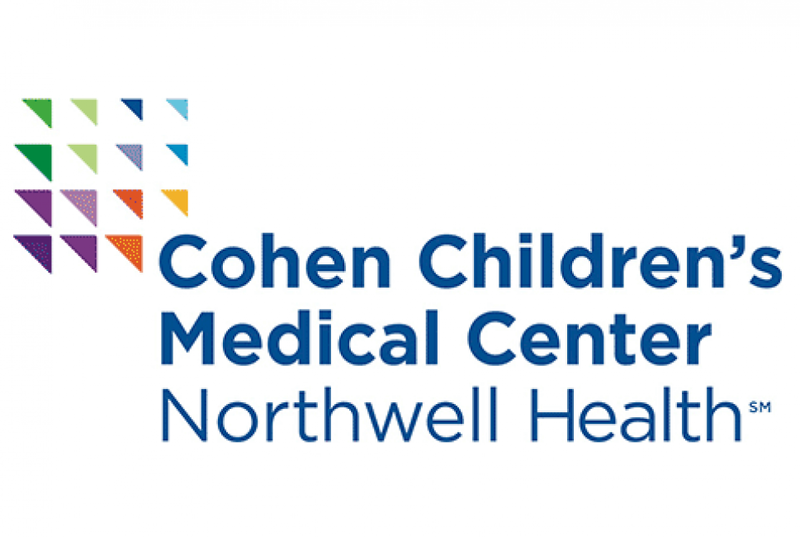 The Steering Committee included Long Island Streets, DEDICATEDD, AAA-Northeast, and injury prevention specialists from Northwell Hospital. Sidewalks for Safety Three Village held a lawn sign contest with students from Gelinas Junior High. The judges loved the colors, message and the hand-drawn elements in Theresa Jiao's winning design. We love it, too! Job well done - and high fives to the runner ups! 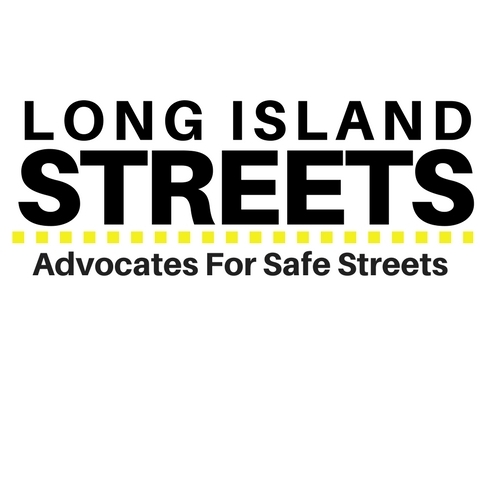 Long Island is receiving $12 million in federal Highway Safety Improvement Program (HSIP) funds for systemic pedestrian safety projects on local and county roads and streets. 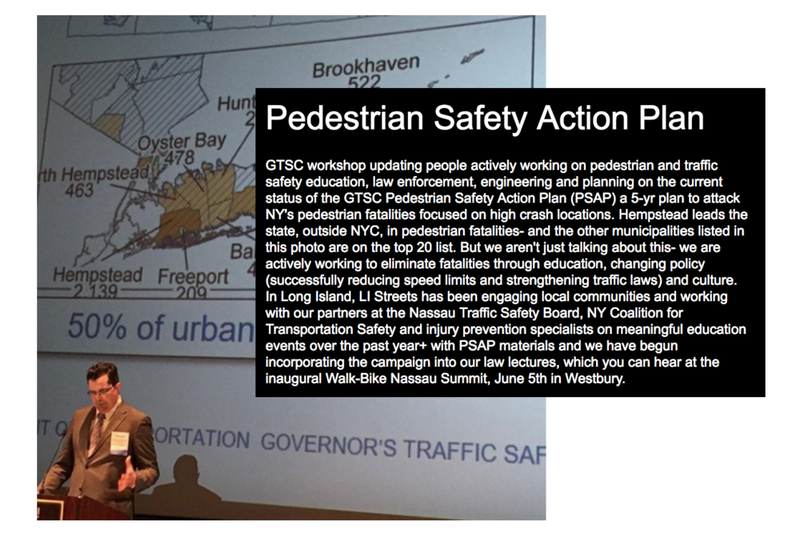 This is being administered by the NYSDOT in coordination with NYMTC following a local call for pedestrian safety projects included in the Statewide Pedestrian Safety Action Plan (PSAP). There were five applications received, three in Nassau and two in Suffolk. This 100% reimbursed HSIP opportunity had just closed the application date a month ago - this quick pick of grantee's indicate how efficient, focused and dedicated those tasked with implementing the PSAP are to addressing the epidemic of pedestrian fatalities and injuries statewide. This is just one sliver of the puzzle that seems to be making some progress. We were updated on PSAP progress last month while attending Walk-Bike New York (click pic for recap). State roads have completed updates, now local roads will start - we will post specific projects after municipalities get their opportunity to announce. The educational component of PSAP has already begun. The New York State Departments of Transportation and Department of Health teamed up with the Governor's Traffic Safety Committee (GTSC) on a first-of-its-kind pedestrian safety campaign in New York State. It provides a $110 million, five-year commitment to improving pedestrian safety across Upstate New York and Long Island by utilizing the Three E's - Engineering, Enforcement, and Education. Advocating for safe streets for all people through education and events. through education, events and reshaping public policy at the local and state level.